Foil Printing Invitations is in vogue these days. 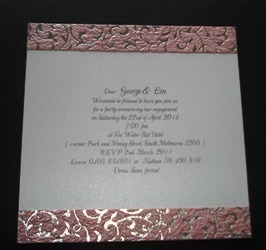 We specialize in Digital Foil Printing Invitations in Melbourne, perfect for wedding invitations so guests’ names can be printed in invitations as this does not use a plate like normal foil stamping requires. 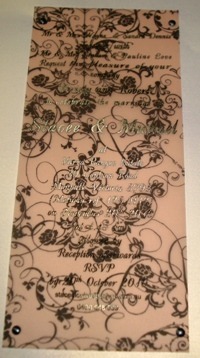 Foil Printing Invitations look glossy and classy. We offer foil printing invitations in Melbourne at affordable prices. Digital foil printing invitations are perfect for all kinds of wedding invitations so guests names can be printed on invitations such as this does not use a plate similar normal foil stamping requires. This includes typesetting and names to be supplied from excel spreadsheet which we send to you to fill in. This process works best on smooth white stock all digital foil is customized to what you want and before we do any printing it is all proofed to you so you get how you want. This photo is of the insert that goes into a Dl sleeve, Tassel extra. 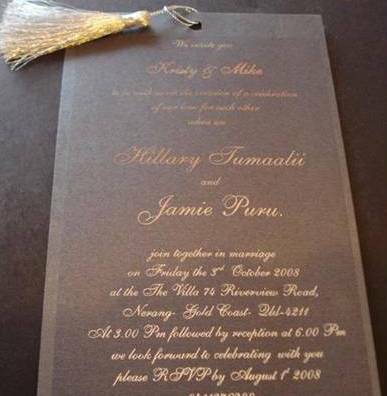 Digital black printing is the most popular for wedding invitations wording.